Did you know the U.S. EPA has estimated that indoor air levels of pollutants may be 2 to 5 times - and occasionally more than 100 times - higher than outdoor air pollutant levels. Indoor air pollutants have been ranked among the top five environmental risks to public health. The problems they cause can be subtle and do not always produce easily recognized or immediate impacts on health. (source U.S. E.P.A.) The average adult at rest inhales and exhales around 7 or 8 liters of air per minute. That totals to be around 11,000 liters of air (388 cubic feet) in a day. So it's important that air you and your family breathe in your home be clear of pollutants. Jack's Heating and Cooling's, whole home indoor air quality approach not only increases the quality of the air within your home, but it also makes a substantial reduction in your homes energy use, which in turn saves you money on your energy bills. Jack's Heating and Cooling are experts at providing air filtration products that work along with your central heating and central air conditioning system. The solutions below used by themselves are effective, but in combination, provide a maximum solution for those suffering from asthma, allergies or other breathing issues. Today's homes are better insulated than ever. While this is great for energy savings, it also means that millions of airborne particles are trapped indoors where they continue to circulate throughout your home, and the air your family breathes. 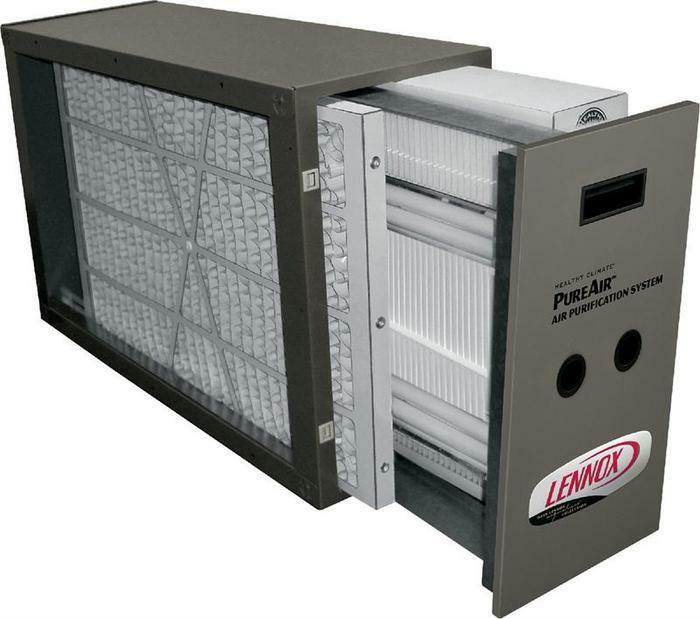 The Lennox PureAir system whole home Air purifiers and filter systems, work with your heating and cooling system to provide a thorough, whole house solution to remove these particles and dramatically improve the quality of your indoor air. Besides providing excellent filtration unmatched by any manufacturer, these home air quality products can also help prolong the life of your heating and cooling system by keeping it free from dirt and dust buildup. Your best defense against poor indoor air quality, is the the PureAir system it uses exclusive UVA-light technology to attack all three classes of indoor air contaminants-particles, mold/mildew/bacteria and odors/chemical vapors. It not only reduces, but also destroys ozone, a known lung irritant. Small, breathable particles such as dust, dirt, pollen and allergens. Airborne mold spores, bacteria and viruses. Hospital inpatient care/general surgery level filtration, whole-home purification works with your existing heating and cooling system. 5-Year Limited Warranty on covered components. Germicidal lights use intense rays of ultraviolet light to control and kill contaminants like viruses, bacteria, mold and yeast. Installed inside your HVAC duct system. 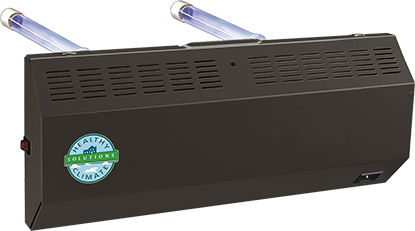 Lennox Healthy Climate UV Lamp attacks and kills mold and bacteria that can grow in moist heating and cooling systems, then circulate through your home. Silent operation enhances your family's comfort and health. Improves the air in your entire home. Call us today to have one installed in your central air system. Powerful ultraviolet energy helps eliminate biological contaminants like mold and bacteria. Improves air quality and protects equipment by sterilizing surfaces. Available in 2,000 microwatts (UV-2000) or 1,496 microwatts (UV-1000). By adding humidity to heated, dry air, the air feels warmer, helps reduce dry skin and static shock plus you can lower the thermostat and still be comfortable, while saving money. 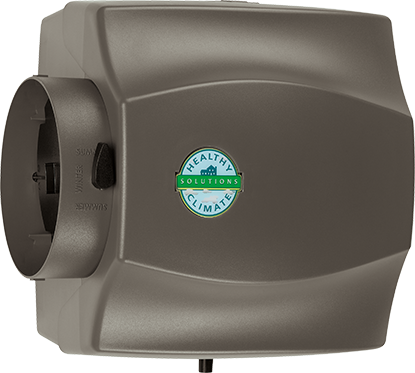 The Healthy Climate Power Humidifier attaches to your furnace or air handler and adds moisture to air moving through the duct system. A built-in fan allows the unit to circulate humidified air even when your heating system is not in operation. Maintains optimal comfort during heating seasons by minimizing problems associated with dry air. Creates a healthier home and lessens skin irritations, sore throats and respiratory problems. Provides an easier-to-use option to portable units-no need to constantly fill and clean units. Built-in fan helps circulate humidified air. Available with automatic control to keep humidity precisely where you need it. New homes and some older homes can be tightly built to save energy, but this can often times have a negative impact on homes without proper ventilation. An airtight home, provides no way to refresh the indoor environment. An ideal solution for tightly sealed homes is a Health Climate Energy Recovery Ventilator (ERV). 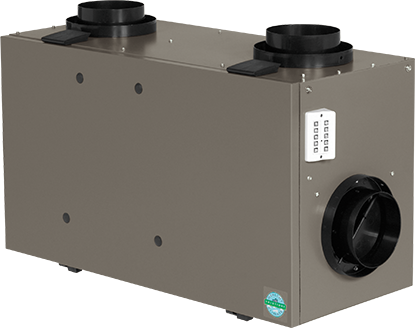 The ERV system exchanges stale air from inside with fresher outdoor air. To ensure absolute comfort, the system captures heat from contaminated air before it is moved outdoors. Provides cleaner, fresher indoor air. Designed to provide comfort in colder climates. Transfers heat from indoor air before it is discharged. Will not restrict airflow for proper filtration. Ideal for new homes which are tightly sealed or remodeled homes with energy efficiency upgrades. All units include a Healthy Climate wall control.